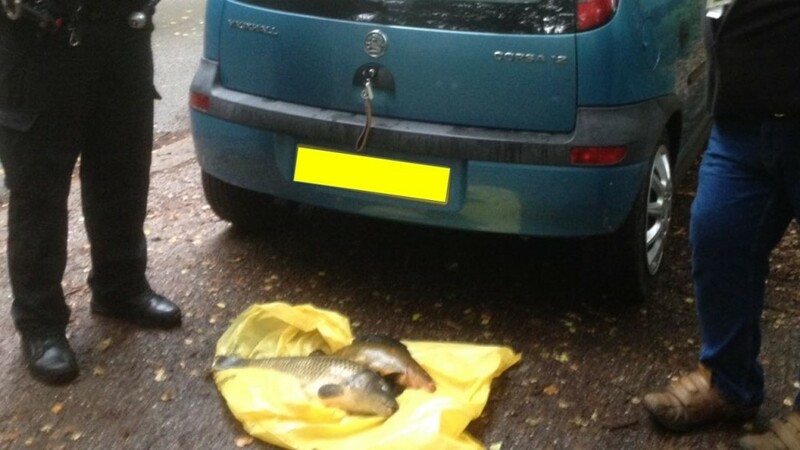 FISH THEFT AT CALFHEATH – ANGLERS CAUGHT BY POLICE!!! You are here: Home / Latest News / FISH THEFT AT CALFHEATH - ANGLERS CAUGHT BY POLICE!!! On Sunday 12th Aug we had reports of 2 anglers on the point at Calfheath reservoir removing fish from the water, luckily a number of bailiffs were available at the time and were able to call in at Calfheath. On arrival at the lake we met the gentleman who was vigilant enough to see what was going on and had the foresight to report it to the bailiff team, he pointed out the 2 anglers in question, plus a trampled down path in the undergrowth behind their pegs where he believed they may have concealed a fish to take away later, and on inspection, sure enough there was a common carp around 12lb in weight thrown in the undergrowth!!! Fortunately this particular fish was just about still alive, we immediately got the carp back in the water and after around 20 mins it thankfully swam off! It became quickly apparent that the 2 anglers were both European (turned out to be Romanians) and spoke very little English, so given we had proof of them removing fish we quickly informed the Angling Trust Bailiff Team, EA & the Police. Fortunately the police & the Angling Trust turned up before the anglers left, this resulted in further questioning, positively identifying the 2 anglers, EA licence inspections and a body search, which resulted finding a provisional driving licence a set of car keys!!! We immediately asked the angers to pack up and leave the venue, the Police escorted them back to their car while the police checked their vehicle and sure enough 2 more fish were found, concealed in bags, in the back of the car (carp around 10lb & a tench around 4lb)!!! Given the gentleman only had a provisional licence the police had no choice but to recover his car, which will now come at some expense to the anglers to be recovered, additionally Blackfords via the EA will continue to pursue further action based the the evidence of theft against the 2 anglers. For legal reasons, we cant name the 2 men or share images of the people involved on the day, but the Blackfords management group would like this to send out a clear message to any angler thinking of stealing, removing and killing any of our fish stocks from any of our lakes….DON’T!! THIS WILL NOT BE TOLERATED!! AND WE WILL TAKE THE NECESSARY ACTION TO ENSURE YOU ARE CAUGHT & PROSECUTED!!! We would just like to thank all of those involved yesterday for their support and quick action, so many times these incidents go unpunished, but thankfully not on this occasion! Can we please ask all members to be vigilant moving forward, if you see, or suspect that fish are being killed or removed please contact us immediately, you can find contact details on your membership card!